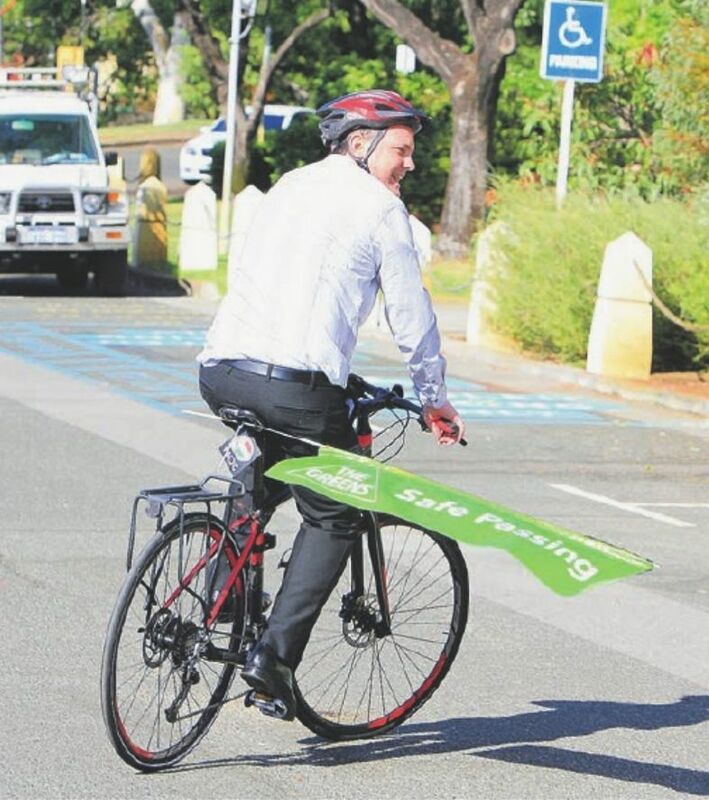 On the front page a politician (can only be) is giving a demo of a new, enormous flag sticking out the side of his bike pannier to show a ‘1-metre’ rule cars should obey if his law becomes effective when travelling near cyclists. Cool. Or is it? Do we need more laws? Yes. There’s no harm in laws. They probably prevented you from having your head chopped off, to this point, your television being misappropriated, and your boss taking a 20% handling fee on last month’s check. Reorganising the pile of red tape so it’s more sensible is never a bad thing, until it becomes the disguise for other new productive work – which is the way it will always end up anyway. Nevertheless we have to indulge them because occasionally someone’s got a big marble they need to push through the parliamentary halls and it might just be worth it. I think this is one, if only because car drivers are a good lot generally who will do whatever Today Tonight tells them – they’re that sort of people, the picnic-bench sitting, Mrs Mac pie eating, carton-of-Masters, 4WD toting, BCF appreciating neck tatooists – and for Today Tonight to broadcast it it’s going to have to find it’s way into mainstream conciousness, which it will always do when it’s a fait accompli and that only happens when it’s law. See, car drivers are a good lot actually. If you have a neck tattoo you probably eat chickens straight out of the cage, feathers and all, but you also ring up Today Tonight and say if it’s a law then our grandfathers must have thought it a good idea too, ‘- and so I eat this chicken to him,’ even if the law only wodged it’s way into our pages and found position 6-months ago. This is the difficult impulse we have to observe – the ‘if you don’t want any trouble don’t do anything wrong’ gene, which will pop up like a newborn daisy after the 1-metre rule is introduced, like granny-tattoo had always thought of it, and it will certainly provide for less bicycle-lane borrowing from Mr BCF and his alpha-female cousins, calling talkback radio and claiming that because ‘mathematically’ riding a bicycle to school is more fatalous than being driven, then cyclists are lethal, sociopathic-vegetarians who should not be allowed to travel about and certainly not to have space on the road, and they should read the law more and see what grandfather always wanted. It will mean that at BBQs and dinner parties cyclists won’t be treated like the tick-ridden immigrant-refugees of yesterday who in principal probably have a right to exist, but only if they can walk the red stones of casual public ridicule until boredom or little laws set in to redirect our angst to eye-level, where it should be, setting and recognising assets around us – and the ability to transport yourself around our city in a variety of ways is one – and then to take these assets and harvest them so they spawn or fertilise more. We don’t know what joys a proper bicycle network will bring to our city – oh, we can look to Amsterdam and Copenhagen and other places where people travel with a stick of white bread under their armpit, but that would be boring. Their lesson to us is eye-to-eye thinking with new assets that spout from the fortunate-to-already-be-fertile social landscape around us, and to pressure them into further productive development. Yes, it is a bit naff when we’re promised New York apartments, Copenhagen bike lanes and Melbourne coffee – and thank The Blues we don’t have to have that. That would be boring – it is boring actually (we have way too much of this governance via someone else’s marketing). The real fun and interest – indeed the actual, true way that Life on Earth is meant to run is regional difference. And if we make jolly flag man in the paper here pull out the ‘Copenhagen’ card – and he will, if you resist his new law, then BCF may never develop their bicycle esky with pre-made ice and fish, nor will we see square-shaped bicycle cup holders with occasional pouch for a pie, sauce and Coffee Chill. Unless you want a stick of bread in your armpit. Which will be boring. Photo violently stolen from The Subiaco Post website. Photographer: Billie Fairclough. Shane Guthrie on a bike.